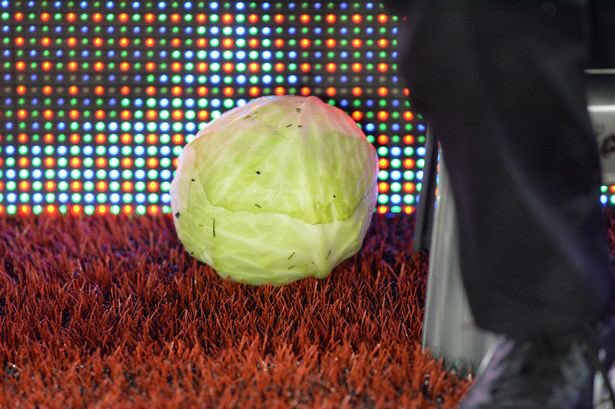 Look alive people, there’s been a development in the ongoing Odyssean saga of Steve Bruce and the Wayward Cabbage. We now have an eye-witness account of the incident thanks to Tim Harley-Easthope, a photographer with BirminghamLive who was stationed right next to the blast zone when the aforementioned leafy green missile was hurled from the stands at Villa Park on Tuesday evening. I was standing by the dugout on the walkround at the side of the pitch. I was standing there waiting to take pictures of Steve Bruce and Alex Neil walking up to us. I was about two yards short of the dugout. This bloke started ranting and raving. I was taking pictures of Bruce and then I felt this object brush past me. It landed on the floor just in front of me. This bloke was irate and was hurling abuse at Bruce. He said something along the lines of, ‘You’re a f**king disgrace’, after he’d thrown the cabbage. Bruce and [assistant manager Stephen] Clemence saw it and they both stood and glared at this bloke and shook their heads. The bloke ran up the steps and into the concourse. It was really heavy. When it hit the floor you felt the thud. Had it hit him on the head, or me on the head, it would have done some damage. It was as heavy as a house brick – it was a big one! And to think we scoffed at the thought of a vegetable being thrown in disgust. Little did we know it was a big cabbage. Honestly, it’s a wonder that everybody managed to escape without serious injury. Poor Fabio Capello. He’s been reduced to being a projectile hurled at Steve Bruce.